How has Focus ADDult helped others? What does Focus ADDult contain? How long does a bottle of Focus ADDult Last? ADD (Attention Deficit Disorder) is a diagnosed disorder which affects concentration, attention span and the ability to focus on the task at hand. ADHD (Attention Deficit Disorder with Hyperactivity) is usually much easier to identify. Apart from their difficulties with concentration and memory, children and adults with ADHD often have associated behavioural problems in class, at home and in the workplace, due to their impulsive behaviour and hyperactivity. Once they are diagnosed, they can receive treatment to help them. Children and adults with ADD (without hyperactivity) often go unhelped and undiagnosed. They may be very intelligent people, but because of their concentration and memory problems, they perform poorly at school and college and seldom reach their full potential. They often feel listless and can lack motivation and energy because of their constant battle to concentrate and focus on their work. Sometimes they can even develop depression, because of their inability to achieve and negative feedback from those around them. Children and adults with ADD are often unfairly called 'stupid', 'dumb', 'lazy' and other hurtful names, when all they need is some help and understanding. ADD is usually present in childhood. If the above symptoms appear in adulthood for the first time, Focus ADDult will still be of great benefit, but the condition may be due to depression, substance abuse or other causes. The causes of ADD are varied. Symptoms consistent with a diagnosis of ADD can have many different causes, including neurological problems, chemical imbalances, diet, learning disorders, depression, anxiety, hearing impairment, lead toxicity, maternal smoking, substance abuse, diabetes and many other factors. If in doubt, it is always better to consult a qualified Clinical Psychologist or health care practitioner. Some recent studies have suggested that problems with CBF (cerebral blood flow) may play a role in the development of ADD. It was discovered that a significant percentage of children with ADD and ADHD symptoms demonstrated impaired blood flow to various parts of the brain, specifically the frontal cortical areas. Adults who suffer from ADD have previously had to resort to children's remedies or prescription psycho-stimulant drugs with their dangers of addiction and side effects. Michele Carelse, our Clinical Psychologist, has many years of experience with both adults and children who struggle with the symptoms of ADD and ADHD. Recognising the growing need for a safe, natural alternative for ADULTS WITH ADD, Michele has formulated Focus ADDult, using a specially selected therapeutic blend of herbs from around the world, specifically to address the symptoms of Adult ADD. For children with ADHD or ADD please see Focus Formula. Focus ADDult is a 100% safe, non-addictive, natural herbal remedy and is formulated by a clinical psychologist specifically for teenagers and adults. This remedy has been used by individuals for many years to promote concentration and focus, without side effects or harsh stimulants. Focus ADDult contains a selection of herbs known for their ability to assist the brain and nervous system, promote circulatory health and overall well-being. Focus ADDult can make all the difference, without compromising health. In this way, Focus ADDult will help address concentration difficulties or inability to remain focused. "I'm 31 years old and have always had trouble focusing & concentrating. I was an ADD child and went onto Ritalin when I was 10. I don't regret it as it saved my school career. I never liked the side effects though. It would change my mood and bring about a numbness and depression. I would start getting irritable after days of use. My friends said to me that they missed the old fun Matt. Since I went onto Ritalin I was no fun. Even as an adult because of my ADD, I struggle to focus on work and tend to make errors. I find it very frustrating. I still take Ritalin once in a while when I need to study or focus on a large project. I searched the net and came across Focus ADDult. I read the reviews and thought I'd give it a go. I ordered Focus ADDult and Triple Complex Brain Tonic from your site a week ago. I read somewhere that someone suggested the two work well together. I cannot tell you enough how happy I am with the products and the results. I'm have been able to work all day and feel very focused. I don't feel drowsy and my moods don't fluctuate. It is such a relief that I don't have to take a product full of chemicals with side effects. I just wish this was available when I was a kid. Thank you for this product. I will be ordering this for the rest of my life." "I don't know how but this stuff does really work. In my case, I feel it has taken effect immediately. I started using it only yesterday and I have been going for hours with my studies. Lemme go prepare myself a cup of tea........I deserve it "
"I just wanted to Thank You, Thank you, Thank you for your Focus ADDult. I have a child (12 year old 6th grader) that has been having trouble with her grades for several years. I have had her tested for every learning problem and even sent her to the expensive tutoring service you see on TV. NOTHING worked. I did a search for ADD med alternatives as I don't think children should be on prescriptions unless it is a last resort. My daughter has been taking your Focus ADDult for about 5-6 weeks and she has not one failing grade now on her report card. Last report card we had 3. All her grades are up to C's. She feels good about herself and doesn't say anything about drinking her "smart water" that she drinks every day. Ha. I'm also thankful you have the drops as she has trouble swallowing pills. The drops have saved her. Thank you so much!" "I want to thank you for your prompt response - and also tell you that I am having excellent results with the FocusADD and Fatigue Fighter. .... I have spent years supplement hunting for a 'cure.' I've tried a multitude of vitamins/minerals/herbs to feel better (I take about 25 pills a day); not to say that they've not helped but, nothing, ever, has helped me the way your remedies have; and in so short a time. I'm almost thinking it's too soon and not possible but the proof is in my renewed vigor and strength. It's truly amazing. ..... I just really wanted to pass along to you that what I thought was out of reach is no longer. My mind is clearer than it's been in years. I have real energy for the first time in years. I'm working on projects I'd set aside, and completing projects I never had the energy - or motivation to complete. It is truly amazing. I keep wondering if it's really real, and how it's possible that after a few days of taking FocusADD and Fatigue Fighter I achieved something I'd searched for for years. THANK YOU." The principle ingredient, Centella asiatica, promotes mental clarity, enhances memory and brain function and helps to alleviate anxiety. This medicinal herb is so highly respected in Ayurvedic medicine for its effect on the mind, that it is even said to increase knowledge of Brahman - the supreme reality. Recent studies have suggested that Centella asiatica improves cerebral blood flow (CBF) and circulation in general, thereby allowing oxygen rich blood to penetrate deep into the brain. Rosmarinus officinalis (Rosemary) is well-known as an all round tonic and energizer. Like Centella asiatica, it also promotes CBF. Recent studies have found that Rosemary contains acetyl-cholinesterase inhibitors, chemicals that prevent the breakdown of acetylcholine in the brain. Acetylcholine is a brain chemical which is involved in memory functioning and acetylcholine deficiency has been linked to Alzheimer's disease and memory impairment. Take 10 to 15 drops in a little water three times daily. Due to the fast acting effect of Focus ADDult (stimulating alertness), it is recommended that the last dose of this remedy be taken no less than 3 hours before bedtime. While some people show a more immediate effect, you can expect to notice a difference in energy levels and mental clarity from about the third week of use. Concentration, focus and memory should improve and this improvement should increase over time and with continued use. You will notice that you can think more clearly and in a more focused way. Students and scholars should notice an increased concentration span and the ability to study effectively for longer periods of time. Be aware that lifestyle factors like diet, health and fitness levels will all play a part in concentration and overall cognitive functioning. While Focus ADDult is highly effective on its own, its effectiveness will be increased with regular exercise, sufficient sleep and a healthy, balanced diet. 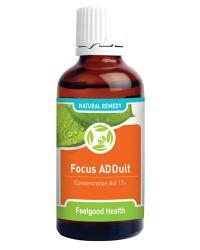 One bottle of Focus ADDult at full adult dosage (10-15 drops three times daily) will last 20-25 days. al-Sereiti MR, Abu-Amer KM, Sen P. Pharmacology of rosemary (Rosmarinus officinalis Linn.) and its therapeutic potentials. Indian J Exp Biol. 1999;37(2):124-130. Bucci LR. Selected herbals and human exercise performance. Am J Clin Nutr. 2000;72(2 Suppl):624S-636S. Crellin, J.K. & Philpott, J. Herbal Medicine Past and Present, Volume 2. A Reference Guide to Medicinal Plants. Durham: Duke University Press, 1990. Ho CT, Wang M, Wei GJ, Huang TC, Huang MT. Chemistry and antioxidative factors in rosemary and sage. Biofactors, 2000;13(1-4):161-166. Mc Caleb, R. "What's New with Ginseng?" Herb Research Foundation, December, 18, 1990. Mindell, E. The New Herb Bible. Vermillion, 1999. Ody, P. Medicinal Herbal - The Complete Guide. Dorling Kindersley 2000. Ott BR, Owens NJ. Complementary and alternative medicines for Alzheimer's disease. J Geriatr Psychiatry Neurol. 1998;2:163-173. Shibata, S., Osamu, T., et al., "Chemistry and Pharmacology of Panax." Economic and Medicinal Plant Research 1:218284. London: Academic Press, Inc. , 1985. Ziemba AW, Chmura J, Kaciuba-Uscilko H, Nazar K, Wisnik P, Gawronski W. Ginseng treatment improves psychomotor performance at rest and during graded exercise in young athletes. Int J Sports Nutr. 1999;9(4):371-377.